When bikers are Realtors or is it when Realtors are bikers. Yep, I have a story! Ray and I are working with friends who live out of state. They are looking for a larger home on a larger lot. They will be retiring soon and will be moving to live full-time on the west coast of Florida. So, their smaller home here will not work as their forever home. The day after they flew back north a house came on the market that fit the criteria. Never fear Ray and I got this. We scheduled an appointment to go preview the house for them. I received confirmation; the appointment was Ok’ed. even better the confirmation says, “GO and SHOW , no alarm, vacant". GREAT! 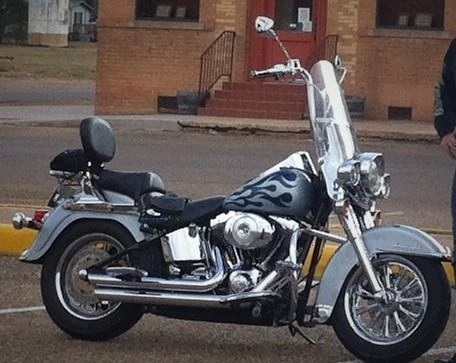 It was a beautiful sunny afternoon, Ray said “Let’s take the BIKE.” ( the Harley Heritage Soft Tail with ape hanger handle bars, beautiful chrome and blue flames –very cool bike.) Well, with hesitation I said alright. We put on our jeans and boots. I put up my hair in a bandanna. I printed out the house information and folded it up and put it in my jeans pocket. And we jumped on the bike and off we went. We pull up in the driveway of a lovely 3 bed, 2 bath home in a sweet neighborhood. I put on my name badge. I ring the bell & knock. I use my magic Realtor key and enter the home. You know that annoying beeping sound you hear when your smoke detector batteries are going out…I hear that when I enter the home. Beep, beep. Ok, smoke detector, I thought. Hmmmm this is a go and show, there are dishes in the sink. Hmmmm the beeping is getting louder and faster hmmmm. I open a guest bedroom door and there is laundry on the bed. Hmmmm, beeping still getting louder and faster. Ray is outside taking exterior pictures of the house. Then I open the master bedroom door and WOW the alarm starts REALLY going off! OH my!!! I call the listing agent. No answer. I text the agent. No response. Alarm getting louder, no longer just beeping. I exit the house. Ray and I are in the backyard discussing the situation. From where Ray was standing in the yard he could see the street and the two police cars arrive. ADT was on the ball. The police get out of their patrol cars and begin to approach Ray. He tells the two officers he is a Realtor looking at the house. Yeah right. We walk from the backyard to the front and hand the police our licenses, our business cards, our print out of the property, our confirmed appointment all the while explaining the situation as we stand next to the Harley and the beeping house. The police officers are just looking at us, taking down all the information. Neighbors are peeking out windows as all good neighbors do when such things occur. The police finished taking their notes and wished us a good day. The agent called. Told her all was fine, the police had just left. Yep, that was keepin’ the real in real estate.